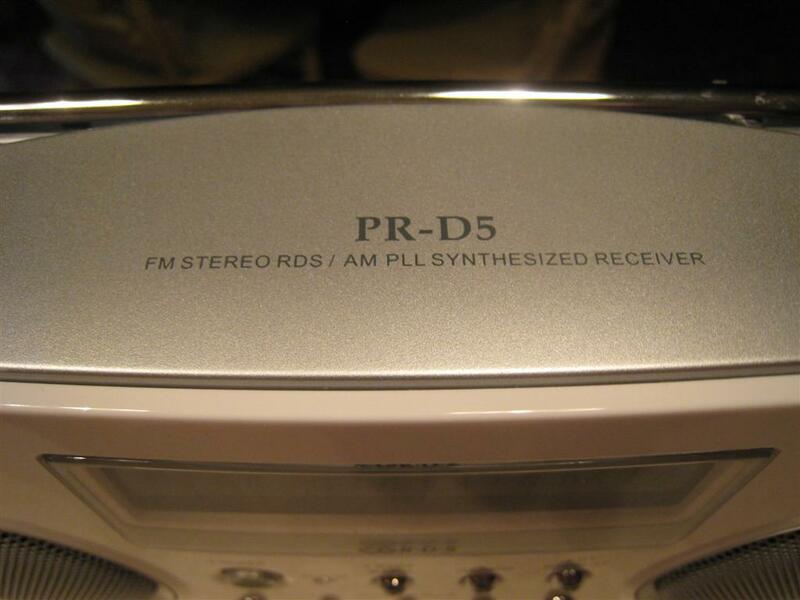 The PR-D5 is an unassuming AM/FM portable radio that looks more like a clock radio than the high performance unit it is. Its sculpted white cabinet looks like it would be at home on a kitchen counter or on your mom’s bathroom vanity and although it is small enough to be easy to carry around and runs on 6 C cells, it does not have a handle. IS IT YOUR MOM’S RADIO? In some ways it is. First, as I said earlier. It does not look like a high performance radio. It is also very simple to operate…for example, it tunes AM only in 10KHz increments, like your car radio. 800, 810, 820 etc. There is no fine tuning in between. On FM the RDS function is always on…there are no selectable modes. 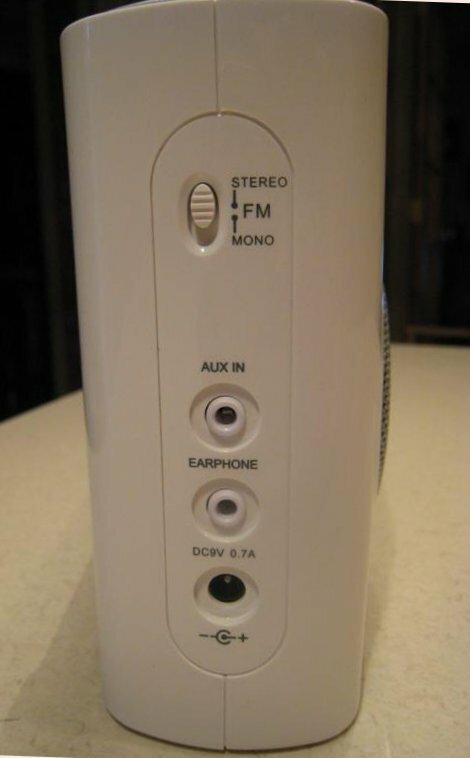 There is a dedicated mechanical stereo/mono switch on the left side…no menus to delve into to find it. Likewise the clock set features are all simple and menu-free. The car radio analogy still holds up. But in a few very important ways it is clearly not your Mom’s radio… for starters it has absolutely superb AM weak signal sensitivity. One look inside reveals how this was achieved…the PR-D5, with no fanfare whatsoever, contains the largest ferrite rod…200 mm (about 7 & 7/8 inches) available in any current production radio…the same size as in some other very highly regarded AM radios. Secondly, much of the circuitry resides on a very high tech chip which helps ensure unit to unit consistency with almost no factory adjustments needed or even possible. Thus any variations in alignment are history. Your PR-D5 should perform the same as mine does. And third, this radio possesses some real audio power. 800 mw per channel is nothing like the more typical (mono) 100 mw you might find in an average clock radio. Its sound is not overly impressive at first, but crank it up and it will surprise you with how loudly and convincingly it can fill a room. I will tell you I was not prepared for this level of AM performance in an under $100 “clock radio”. 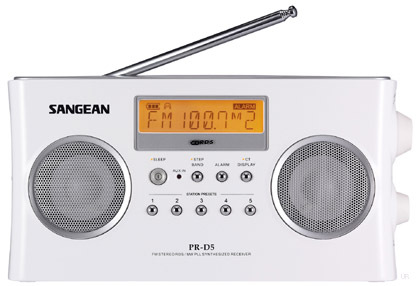 But on AM the Sangean PR-D5 is what I call “top tier”…it’s sensitivity to weak AM signals is just about as good as it gets…any differences between it and the very best portable radios available at ANY price are exceedingly small, and in actuality, will be unnoticeable unless you live in an unusually low noise area. In most settings the PR-D5 will deliver AM reception as good as or better than any other AM radio you may care to compare it against. That is no small claim. After spending hours scanning the entire AM band over the course of several days I did find some signals that were just a hair better on a few top rated AM portables but they cost considerably more than the PR-D5 and again, the differences, although noticeable, require careful side by side testing to notice. FM reception is very good…not as outstanding as AM but by far good enough to pull in all my usual signals in perfect stereo. For slightly weaker out of town signals where hiss becomes noticeable you can easily switch it to mono and kill the noise. Selectivity is not as sharp as on several portables noted for excellent FM sections but the Sangean will pull in typical signals with no problems. Sound quality is a bit on the dull side with a decidedly mellow sound on AM and slightly restricted bandwidth sound on FM. It can’t be called wide range but it is powerful…with 800 mw per channel this radio will fill a room or patio with more audio than you would expect from its smallish size and unpretentious appearance. Hearing stereo pouring from this small box was a real treat. I also liked its easy to use design and dedicated controls. A slider Stereo/Mono switch on the left side, clock and alarm setting and presets as simple to set and use as any digital clock or car radio, and no menus of any kind. 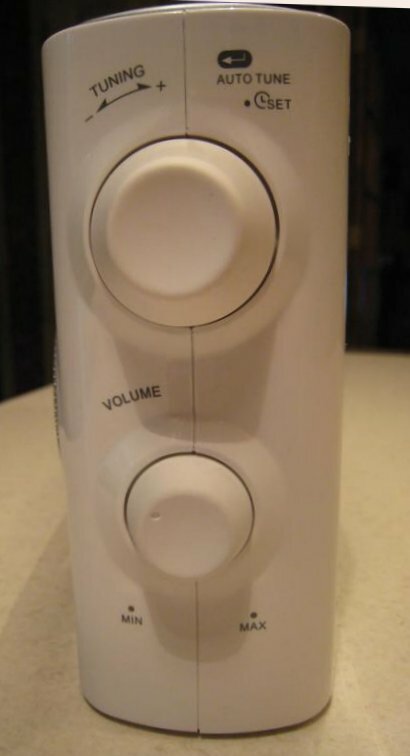 Not a radio for tweakers, this is designed to be so straight forward that anyone can use it. 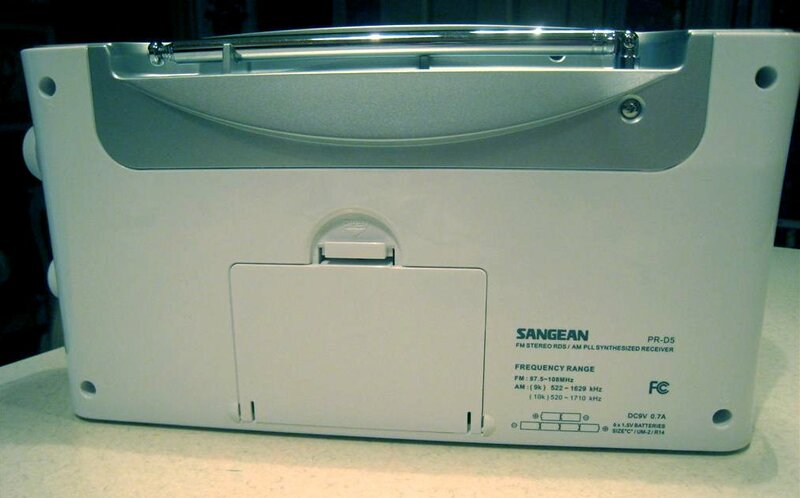 The Sangean PR-D5 is a diamond in the rough. It so far outperforms the everyday “appliance” type of clock radio that I was amazed. I do wish it had a handle… some will criticize its lack of 1 KHz tuning steps on AM and restricted audio bandwidth with no tone controls… and there are radios that add those features and many others as well…at a price. But for what it was designed to do…provide state of the art AM reception, decent FM reception and powerful sound in an easy to use, affordable package, the Sangean PR-D5 succeeds and does so very well. And yes…I think your Mom would like it too!